In this day and age where technology has transformed and revolutionized human interaction, the Science, Technology, Engineering, and Mathematics (STEM) approach to education is now more critical than ever. It is with this philosophy in mind that the Harlingen Consolidated Independent School District has implemented a district-wide Robotics program across all elementary, middle, and high school campuses. Robotics club sponsors across the district have met to ensure vertical alignment across all levels and to cultivate a FIRST program that seamlessly flows from introduction to mastery of concepts and skills. Paul Tenison, an engineering teacher at Harlingen High School, is enthusiastic about younger students strengthening programming and code-writing skills, allowing him and his team more time to fine-tune their robots, rather than spending time on learning coding fundamentals. The University Interscholastic League (UIL) Robotics pilot program began during the 2015-2016 school year, prompting the district initiative to extend the already growing Robotics program. In the past 16 years, students from the HHS Engineering and Tech clubs have qualified and competed at two state and four national competitions in various robotic events. Teams work two hours after school, five days a week, Monday through Friday and some Saturdays. Out of 33 HHS Engineering Club members, 10 students will be screened and selected to partake in UIL robotic competitions, where they will implement design processes used by engineers to solve problems. Students use drafting, CAD skills, 3D modeling, and 3D printing technologies, and they must adhere to engineering safety and documentation procedures. Teams are responsible for the research, design, assembly, troubleshooting, and operation of different types of robots including underwater remotely operated vehicles (ROV), autonomous robots, and rockets with sensors and recovery systems. The high school robotics teams have previously collaborated with elementary schools through mentoring and motivational events created to promote robotics with the young students, but now the aspiring learners are experiencing first-hand the application of critical skills to real-world scenarios. Lamar Elementary Library Media Specialist Diana Alfaro accounts public speaking as a major challenge at the elementary level. 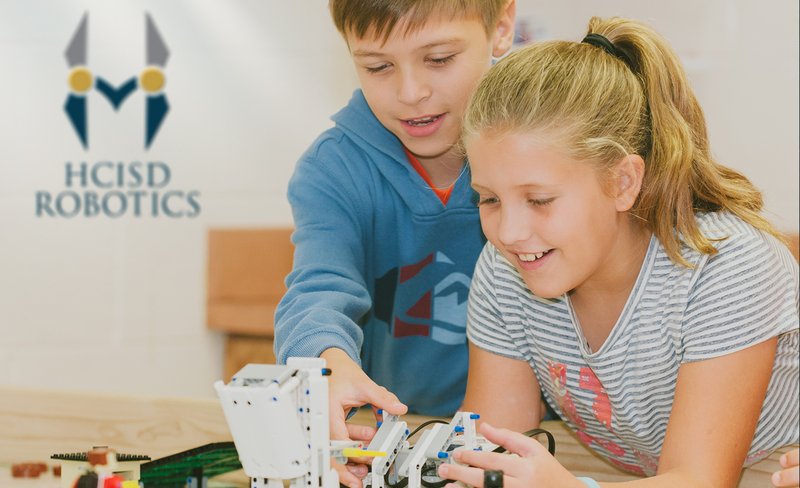 The robotics program addresses this challenge and promotes the 4Cs of the 21st century—Communication, Collaboration, Critical Thinking, and Creativity. Second- and third-grade students are challenged to use curiosity, teamwork, exploratory research, and collaboration to solve a real-world scientific problem and express the solution using a model created with LEGO bricks. The model must include at least one simple machine and have moving parts. The VMS Robotics Club fosters problem-solving strategies, computer programming skills, and critical thinking tactics as students in their competitive team design the construction of an EV3 Mindstorms robot and program it to perform a variety of missions. As part of FIRST LEGO League, students work for two to three hours a week learning the basics of programming while cultivating the FIRST core values. HCISD is now the only district in the Valley to offer a full-scale robotics program at every campus.